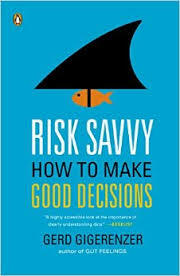 Gerd Gigerenzer has a 2014 book out entitled: Risk Saavy, How to Make Good Decisions, that is a refinement of his past books for the popular press. It is a little too facile, but it is worthwhile. Gigerenzer has taught me much, and he will likely continue. He is included in too many posts to provide the links here (you can search for them). My discussion of the book will be divided into two posts. This one will be a general look, while the next post will concentrate on Gigerenzer’s take on medical decision making. As in many books like this, the notes provide insight. Gigerenzer points out his disagreements with Kahneman with respect to heuristics all being part of the unconscious system. As he notes heuristics, for instance the gaze heuristic, can be used consciously or unconsciously. This has been a major issue in my mind with Kahneman’s System 1 and System 2. Kahneman throws heuristics exclusively into the unconscious system. I also side with Gigerenzer over Kahneman, Ariely, and Thaler that the unconscious system is associated with bias. As Gigerenzer states: “A system that makes no errors is not intelligent.” He interestingly points out the use of the gaze heuristic by Sully Sullenberger to decide to not return to LaGuardia, but instead to land in the Hudson River. Fix your gaze on the tower: If the tower rises in your windshield you won’t make it. I also like his criticism of nudging as soft paternalism, and that we should try to educate people so nudges will not be so necessary. However, I would say that if we work hard to educate, then maybe we should keep nudging. Fear whatever your social group fears. Gigerenzer notes that different tools work when dealing with risk as opposed to uncertainty. Statistics are good with risk, but heuristics are better with uncertainty. It seems to me that there is more or less a continuum, like Hammond’s cognitive continuuum (post Cognitive Continuum), where coherence/risk is on one end and correspondence/uncertainty on the other. You have to mix and match skills. That is part of ecologic rationality. Gigerenzer suggests that trust is the mother of all rules of thumb. Rules of thumb are often like aphorisms-there always is a counter position to each. This does not make them useful. I do believe that the use of his fast and frugal decision trees could be helpful in many fields where the decision environment is relatively stable. The chapter on leadership and intuition is weak. Gigerenzer seems to faun over business leaders and their use of intuition–gut feelings–while medical doctors are not allowed. He does not seem to allow for the possibility that business leaders are much like stock market predictors. Although they may be generally capable, they are on top largely through luck. Jack Welch, the long time General Electric CEO, was a gut feelings guy, but his successor Jeffrey Immeldt, a more by the book guy, has been quite successful for nearly as long. Jack Welch was the manager of a factory where an explosion blew the roof off early in his career. And Gigerenzer did not mention President George W. Bush for his seat of the pants leadership. Gigerenzer seems to believe that family run and owned businesses allow one to employ the best of intuition as opposed to defensive (cya) decision making. I doubt it. In my experience, no one can squelch intuition or rationality better than the self made company owner. I must side with Betsch and Glockner with respect to the use of intution (Post Intution in J/DM). Betsch and Glockner believe that information integration and output formation (choice, preference) is intuitive. Analysis involves directed search (looking for valid cues or asking an expert for advice), making sense of information, anticipating future events, etc. Analysis gathers the information, and intuition puts it together and gives you the answer. Your gut feelings are usually not very good if they have not been nurtured by a great deal of conscious effort and/or physical work and repetition. I believe that Gigerenzer would better emphasize that going with ” gut feelings” should be limited to stuff that does not matter or stuff for which you are an expert. Now that could be deciding on a girlfriend or boyfriend–who is a better expert on your feelings than you, or it could be something about which you have years of education and experience and has a “kind” environment. There are no experts at least for predictions in a “wicked” environment (Hogarth post Learning, Feedback, and Intuition). He concludes by noting that experts for health and wealth are a rare breed so you need to make your own decisions. As a master of none, I would suggest that there are many experts, but that you still need to make your own decisions. I believe that Michael Mauboussin’s skill luck continuum (Post Regression to the Mean) contributes something here. If you could predict the future, you could definitely become very wealthy. No one can, but that does not mean that there are no wealth experts. It is similar with health. Gigerenzer although pointing out the benefits of heuristics and gut feelings makes recommendations for education that primarily aimed at improving our analytical skills. His education plan for young people to improve risk literacy would cover health and financial risk and digital risk competence. Each requires skills using rules of thumb, numeracy/statistical thinking, and the psychology of risk. This entry was posted in Expertise, Heuristics, numeracy, Risk communication on November 12, 2014 by admin.